So Rhodes fell. Isn’t it now time for the real physical spaces that divide us to fall, to be demolished, to transform and re-contextualised? My hometown of Actonville made the news in the last few weeks. For all the wrong the reasons though. It was cast as a hotbed of xenophobic violence. The news reports focused on riot police subduing angry mob of protesters spewing foreign vengeance. The focus was on the ever-present Hostels. The hostels were borne as a housing for migrant workers in the mines during apartheid. Dormitory housing, for men-only under atrocious undignified conditions , they were frequently described as labour camps at the time. In 1992, even before the official fall of apartheid, the hostels were seen as tangible product of apartheid. According to South African history online, discussions had been held between President de Klerk and Nelson Mandela on the question of the hostels and agreement had been reached that to phase them out and make provision for both family and single person accommodation. Since then nothing has changed. Fear. Crime. The hostels loom large on the no-go areas for the communities they located in. The hostels remain hotbeds and incubators of crime and a continue to be a symbol of fear and division in struggling communities. I know. I have watched it within my community first hand. Almost two decades ago, my thesis revolved around the divisive nature of the Actonville hostel located at the edge of our township. The hostels at the time, housed largely Zulu migrant workers who worked in and around the metal industries and mines in the area. Around the time of the first democratic elections, they continually erupted in protests, violence and crime. The two neighbouring townships alongside it the then Indian area – Actonville and the largely Xhosa area -Wattville, were equal in their apprehension and fear of those dominant forms. Over the years, the inhabitants continue to hold the community ransom. Unknown inhabitants linger in and out, without clear ownership and control. Un-serviced, crumbling buildings where criminals regularly defy police by hiding within them. So while, Rhodes was important to fall as colonial symbol given a place of privilege. The hostels, like the buffer zones that separated us, are a more tangible presence of oppression. The hostels still standing are a more salient proof of our inability to transform. I have lived down the road from the Actonville hostels all my life, and it has remained shockingly unchanged. Almost untouched. 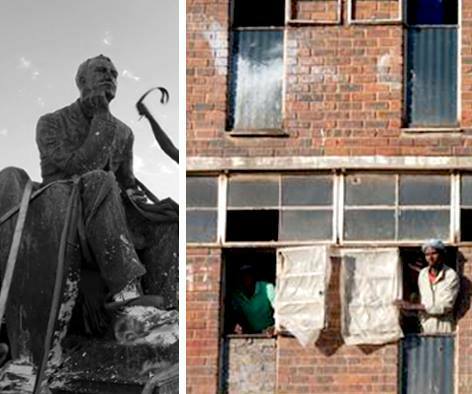 Like the other hostels – where we watched South Africa’s shameful xenophobic attitudes revealed, I watched with surreal deja vu journalist being stoned at Jeppe or read that the killers of Emmenuel Sithole emerged from the Alex hostel. So Rhodes has fallen. Now the hostels must go. Transformation must become real, it must deal with physical spaces that remain divisive within communities that still continue to struggle after the fall of Apartheid. Transformation must become tangible. The hostel issue was brought to the forefront last week when Lindiwe Sisulu, like many politician before her said ,They (hostels) are a very painful relic of our past… They (hostel residents) should live as part of society, as reported in the IOL news article..
She elaborated further in the article that ‘ the government would like to â€œgradually abolish hostels in our towns, and hostel dwellers who have lived in our towns for a number of years would qualify for a Breaking New Ground house, or the CRU (community residential units) subsidy, depending on their specific circumstancesâ€. But hostel residents are skeptical and refuse to inhabit the newly refurbished Diepkloof Hostels in Soweto. They claim as per the article that they were not consulted and can’t afford the rental. This mirrors the situation at Actonville hostel where the dwellers have regularly protested over lack of services and unacceptable living conditions. Hostels should demolished. There is too much of our past history imbued in its walls to disassociate from with an upgrade. Even if family units were envisioned like on the Diepkloof site. The sites themselves were too much on the margins of the townships, both physically and metaphorically, and located on the buffer zones that were physically part of the apartheid city pattern. This is true of Actonville. They are divisive forms from there inception. They must be replaced with worker housing that are physically located within the communities themselves. Mixed units for families with shared and single accommodation. Housing for workers should be a new typology to be explored, not lumped within the current desperate need for general housing. Abit unfairly I think , the Minister stated : “Most of them (hostel residents) have spent a great deal of their time in cities. That they may have a holiday home in Mqanduli (in the Eastern Cape) doesn’t make them different from someone with a holiday home in Camps Bay who works in Brakpan, The needs of the hostel dwellers are vastly different but equally desperate to other dwellers of the townships. Flatten the hostels. Appropriate housing for workers must be built. Serviced dignified spaces that reject compound-like blocks. Individual units that can accommodate different housing types. spaces where families are allowed, feel safe, that are integrated in communities in which they are built. These relics of Apartheid must be flattened. Spatial transformation must get on the agenda. Real change is long overdue.